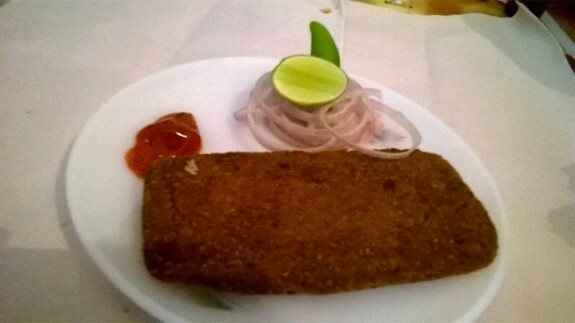 Find out how to make Fish Cutlet with our easy guide of Fish Cutlet recipes from The Masala Route. 1. First pat the fish pieces in the paper towel to make it dry. 2. Take a medium bowl and mix onion paste, garlic paste, ginger paste, green chilies paste, roasted cumin and coriander powder, pepper powder, garam masala powder, 1 tsp salt, chopped cilantro and squeeze the lemon juice. Mix everything well to make a smooth paste. 3. Now spread the mixture on the top as well as other side of the fishes. 4. Refrigerate the marinated fish about an hour. 5. Take another bowl and break the eggs. Mix it well. 6. In another plate, spread all purpose flour and in the 3rd plate spread breadcrumbs. 7. You can sprinkle some salt and pepper powder on the breadcrumbs. 8. Now we have to coat the fishes. 9. First use corn flour, then egg and then breadcrumbs. Again coat it with eggs and then again in breadcrumbs. 10. Repeat the same process with other marinated fish pieces. The fishes are now nicely coated and ready to fry. 11. Heat 1 inch of oil in a pan. Now add fish to fry it properly. Turn this to other sides and fry it until they are golden brown in colour. 12. Your fish cutlet is ready. You can enjoy this recipe with onion salads and tomato ketch up too.